In a greased, shallow, 9 ½x11 baking sheet, line the rim with 6-8 bread strips, twisted slightly, creating a frame of bread (pinch together bread sticks to form a continuous frame). Next, make one horizontal and two vertical rows with the remaining bread strips, creating squares about 3 inches wide. Brush the bread dough with slightly-beaten egg (this creates a beautiful, shiny finished dough frame and it helps to "glue" the bread strips together). 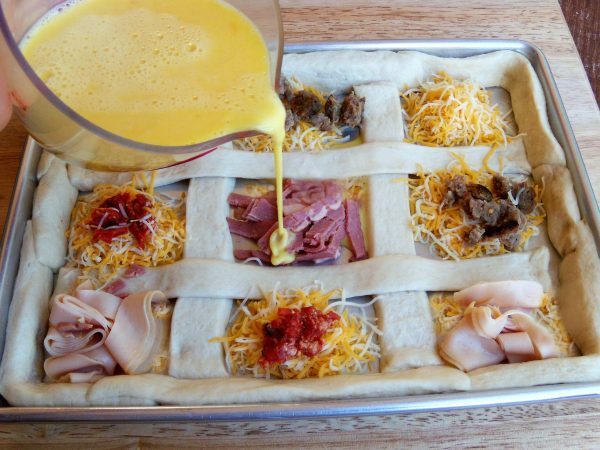 Fill each square with ¼ cup cheese and ¼ cup desired topping. In a medium bowl, whisk together the remaining 6 eggs and 2 tablespoons of milk. Pour the egg mixture over bread picture frame and toppings, covering the bread. Add salt and pepper. Bake at 350°F for about 20 minutes, or until the bread is golden-brown and the eggs are cooked. Slice in squares, using the bread dough to frame each slice.